Latest trend in Kerala is to stream funeral service through website.Expatriates living in different countries often do not get extended leaves on short notice when family members in India die.Also one may lose their job, family, visa, survival etc. during such tough times. This may be behind the reason trend to hire a videography services provider in Kerala.They will live stream the event and their technical consultants (people like me who manage websites) will make sure the events are streamed on the website.Youstream, Justin, Livestream, Bitgravity, streamhash,Streamshark were the popular live videostreaming service providers.Live streaming hit jackpot when free & quality live streaming services such as Youtube Live as well as Facebook Live arrived. Now live streaming is on a different level.The cost has come down to zero.So any one can do live video streaming of events.So video production services as well as amateur videographers are now offering videostreaming.The relatives assemble at a common place in foreign countries and watch the funeral event live.Considering the cost of flight tickets and other expenses of all the family members , the new generation thinks that outsourcing the event to an event management consultant makes sense.The disintegration of the joint family (undivided family) to nuclear family system makes these all events look normal and unnoticed. 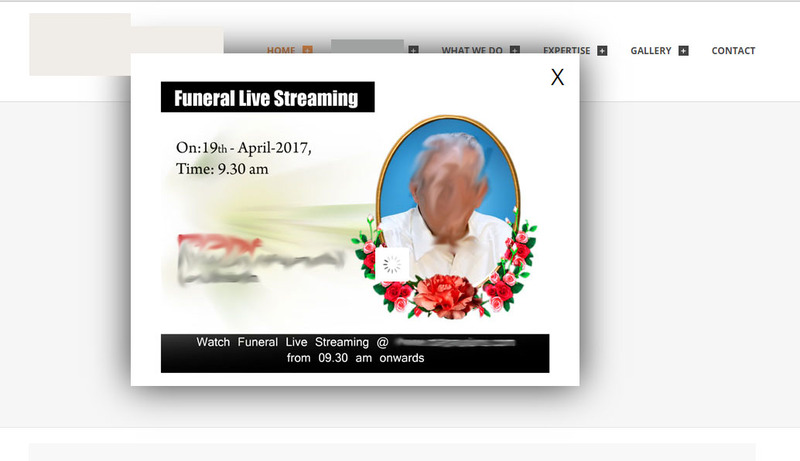 Roni Thadathil Raju: Live streaming is really helpful to the dear ones who where unable to attend the service, now am watching a funeral service,live from Oklahoma. It's difficult to travel to USA in a short span , so live telecast is the only option. Changes according to the technology.